The ‘Brigade Juive’ claims to have sent the threatening email to 8,000 activists worldwide, lamenting that since French law doesn’t do enough against boycott supporters it must take matters into its own hands. A right-wing group calling itself the “Brigade Juive” (Jewish Brigade) says it sent thousands of threatening emails and messages to boycott Israel activists around the world overnight Thursday, promising to “put an end to BDS.” The messages were apparently sent primarily to activists in France, Australia and Israel. The email, sent to 8,000 email addresses according to the group’s Facebook page, included a link to a longer Facebook post in which the group claimed that BDS activists are fans of Hitler, Holocaust deniers and inciters of hate. It went on to explain that French law doesn’t do enough to stop boycott-supporting activists and organization operating in the country, so it must to take matters into its own hands. In its report on the threatening email, the Electronic Intifada warned activists not to click on links in any threatening emails noting that they might contain malware. Local activists told +972 that the “Brigade Juive” is believed to be tied to the French branch of the Jewish Defense League (JDL), a militant organization started by Meir Kahane in the United States in the 1960s, and which has been outlawed for terrorist activity in the United States and Israel. 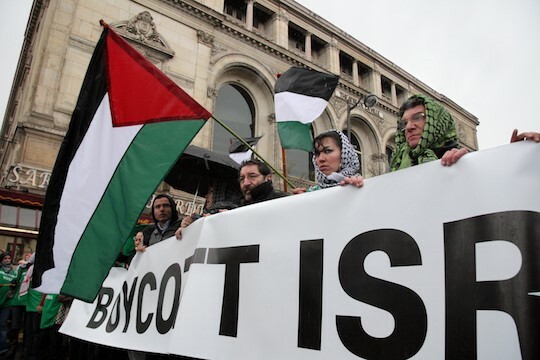 In recent years, the French branch of the organization has directed much of its activities against Palestinian and French groups that oppose Israel’s occupation of the Palestinian territories and people, usually claiming that they are anti-Semitic. It recently began targeting the BDS movement. In March 2014, Israeli investigative journalism program “Uvda” ran a story (Hebrew) about the “Jewish underground operating in France” and its leader, a young man named Yossi Ayache, who has been based out of Netanya in Israel for the past few years. The television report portrays a quasi-military organization composed of hundreds of young French Jews who utilize violence in the name of “fighting rising anti-Semitism in France.” The report detailed how they learn how to utilize physical violence, train to withstand tear gas, learn to break bones, go undercover as Arabs in Palestinian French groups, burst into events and offices, and of course, beat people. Anti-occupation activists in France have long faced violence, harassment and violence from radical right-wing Jewish groups. Take for example well-known JDL activist, hacker and self-described “militant Zionist” Gregory Chelli, who as of August 2014 was reportedly living in Ashdod, Israel (Hebrew). Chelli, who reportedly goes by the online name “Ulcan,” is primarily known for reported electronic break-ins of news organizations who he believes unfairly cover the Israeli-Palestinian conflict, and for allegedly harassing journalists and political activists he views as enemies, and their families. Chelli was given an 18-month suspended sentence for his part in setting fire to the motorcycle of a French political activist. He has also been interrogated by Israel police. Ulcan’s tactics in the past have reportedly included publishing journalists’ and activists’ personal information, making fake police reports that resulted in large-scale raids on his targets’ homes, and falsely notifying targets’ families of their deaths or injury. A new puppet master in town? Speaking at the Herzliya Conference on Thursday, Israeli Public Security Minister Gilad Erdan stated that Israel needs to send a clear message, with legislation or other means, that “it’s not worth being a BDS activist,” and that such activists need to be made to pay a price. It appears somebody is already heeding his call. Erdan also went into detail about the Israeli government’s role in fighting anti-Israel activism around the world, saying that while the State of Israel isn’t suited to tackle each individual threat as a state body, it is well positioned to coordinate the various private organizations and bodies which are active on the country’s behalf. One can only hope this isn’t an example of such coordination. Yael Marom is Just Vision’s public engagement manager in Israel and a co-editor of Local Call, where a version of this article first appeared in Hebrew.